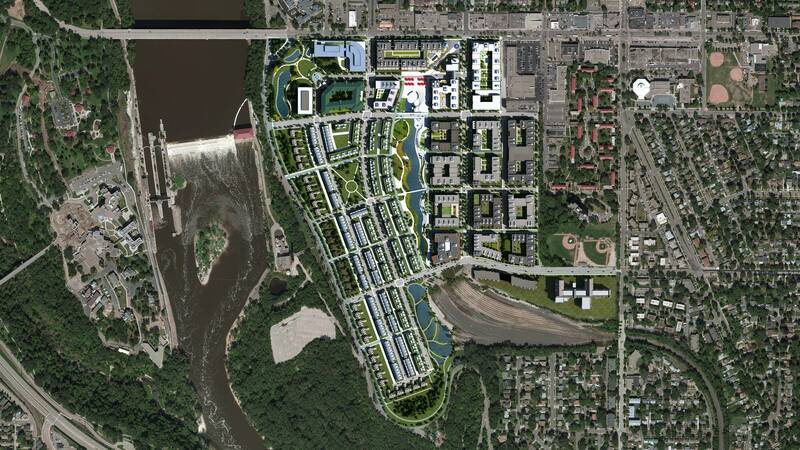 A rendering of an aerial view of Ryan Cos' concept for the Ford site in St. Paul. Courtesy of Ryan Cos.
More detailed development plans for the huge site of the old Ford plant in St. Paul are beginning to take shape. The City Council Wednesday approved a raft of changes requested by the developer, Ryan Cos. Chief among them is a proposal to add single-family houses along Mississippi River Boulevard — but that idea is controversial. Ryan wants to build 3,800 homes, plus office, retail and green space on an empty 122-acre piece of riverfront land where Ford built cars and trucks for nearly 90 years. Well before Ryan was picked as the developer, the site was the subject of intense debate in the Highland Park neighborhood: How dense is too dense? What about all the extra traffic? Will the new buildings fit in with existing architecture? Ryan executives adjusted their plans in response, lowering building heights, for example. Now they've won City Council approval for more changes, such as allowing single-family houses near the Mississippi River, more business parking and the elimination of some required commercial space. "I believe that the changes Ryan put in there were reasonable and ultimately are going to help ensure that we deliver this site in the vision that we set out," said Chris Tolbert, a council member who represents the area. Ryan has promised to make 20 percent of the homes accessible to people of modest means. That includes nearly 380 units designated for those who make 30 percent or less of area median income or about $28,000 a year for a family of four. At a council meeting last week, Ryan's Senior Vice President Tony Barranco said his company stands by that goal, but said the overall project will face the realities of the marketplace. "We've really tested to make sure what's there is sound in principle and plan, and also that can perform," Barranco said. But Ryan's proposal to build single-family homes has received pushback from some in St. Paul. At the same meeting, Rob Wales with Sustain Ward 3, a Highland Park group that wants a high-density, environmentally friendly development, said the move could segregate people by income. "The proposed single-family housing, the reduction in heights, as well as the removal of minimums on commercial space will create a de facto wealth zone on the western side and isolate that from the rest of the site," Wales said. "We also believe that increasing the parking on the site will encourage driving to the site." In a letter, the city's Human Rights and Equal Opportunity Commission says keeping the proposal for multifamily homes along the river would allow for more equitable access to a unique city asset. Rebecca Noecker was the only City Council member to vote against Ryan's request Wednesday. "I continue to believe that it is possible to have multi-family housing along the river," Noecker said. "And I continue to believe that's an important part of our vision for the site." Tolbert said the project is a long way from groundbreaking. Ford still owns the land, and Ryan is figuring out the complex financing arrangement needed to buy it. That is likely to include public money. In an application to the city last February, Ryan requested $107 million in tax-increment financing. More than half would be for road, utility and other infrastructure construction. The rest would be used to build the affordable housing that is a key goal of the project. Matt Sepic is a general assignment reporter for MPR News.